Foreign Minister Chrystia Freeland stressed the importance of the Canadian military training mission in Ukraine. 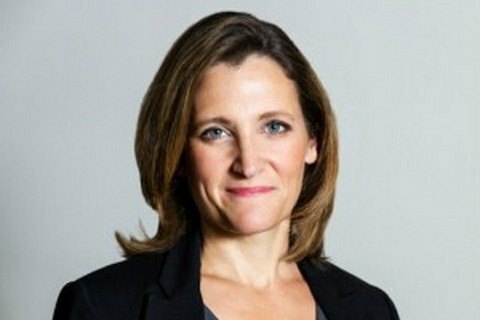 Canada is ready to continue to defend Ukraine's sovereignty and to promote reforms in the country, the Minister of Foreign Affairs of Canada Chrystia Freeland said on March 6. Canada is unshakable in its support for Ukraine, both in helping to protect and preserve the sovereignty of the state and in facilitating key reforms, Freeland said. She also stressed the importance of the Canadian military training mission in Ukraine UNIFIER. "The mission of UNIFIER is a critical component of multilateral support for Ukraine, it supports the professional growth of the Armed Forces of Ukraine necessary to contain aggression and create a safe space for sustainable social and economic development, which the people of Ukraine want and deserve," the minister stressed. Earlier it was reported that Canada Canada is officially extending its military training mission in Ukraine until the end of March 2019. 200 members of the Armed Forces of Canada arrived in Ukraine in January 2016. Ukraine's ambassador to Canada hailed the news. "It is a sign of solidarity with Ukraine, a powerful signal of deterrence to Russia and a strong sign of Canadian leadership in dealing with global challenges," said Andriy Shevchenko.